The Stockton Ports were on their way to a loss. Relief pitcher Juan Uribe helped eat innings. The Ports didn't score until the ninth inning. In all, rival Modesto scored eight times. Three Stockton pitchers combined to face Modesto that night, among them was Uribe, according to The Lodi News-Sentinel. 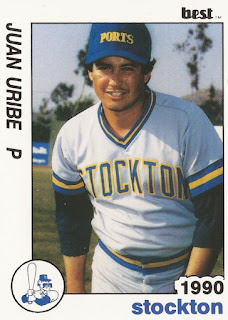 Uribe pitched that year in his third season with time in the United States. It was also his last season in the U.S. After already spending time in his native Mexico, Uribe is credited as continuing his career there. Uribe's U.S. career began in 1987 when the Brewers purchased his contract from Monterrey of the Mexican League. He got into two games for single-A Stockton that year, giving up three earned in 2.2 innings. He then returned to play at single-A Beloit for 1988. Uribe then returned to Mexico for 1989, playing at Monterrey. His final professional season in the United States came in 1990 back at Stockton. He got into 31 games in relief, starting two. He picked up one win, 11 saves and a 4.62 ERA. Uribe is then credited as returning to Mexico to play, playing there as late as 2001.